Myth: Chameleons change color to match their environment. Chameleons don’t change color to match their environment. Rather, they change color as a response to mood, temperature, health, communication, and light. Now, not all kinds of chameleons have the ability to change color and some only have limited ability for color changing; for instance, many types of chameleons can only turn, green, brown, or gray. Others have the ability to change to a variety of different colors including: pink, blue, red, orange, green, black, brown, blue, yellow, turquoise, and purple. Of the ones that can change color, they’ll often change to darker shades, when they are cold, and will lie out in the sun during this time. Likewise, if they are hot, they can change to lighter colors which will reflect the sun better, helping to cool themselves off. Most color changes though are simply due to mood changes or for communication purposes. 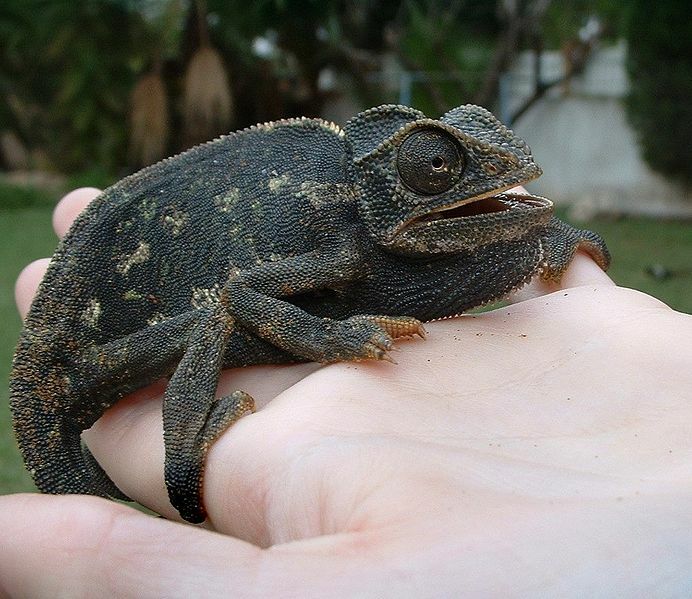 For instance, the Panther Chameleon will change to red and yellow when they are angry or are getting ready to attack. This serves as a warning to other chameleons and humans to back off. Some types of male chameleons will also change to mixed bright colors when they are trying to attract a nearby female chameleon. Those chameleons that can change to a variety of colors can do so thanks to special cells, collectively called chromatophores. These chromatophore cells are grouped in layers underneath the chameleon’s transparent outer skin layer. The upper most layers contain yellow and red pigments. The lower layers are comprised of a colorless crystalline substance and melanin, which both are used to modify the visible color of the upper yellow and red pigments, producing a variety of colors. In addition to that, the melanin layer also controls the intensity of the final output color. Chameleons that can change color typically can change from one color to another in less than 20-30 seconds. Chameleons are extremely territorial. They also typically like to be by themselves. Some types of chameleons have tongues that are actually longer than their whole bodies. These tongues can be fully extended as fast as 26 body-lengths per second, which is faster than the human eye can follow. Chameleons have the ability to see ultraviolet light. People who own particularly colorful types of chameleons can usually quickly learn to discern the mood of their chameleons and whether the chameleon is sick or not, simply by looking at its coloration. Why Do Chameleons Change Color? What Causes a Chameleon to Change Its Color? How come there are some videos on youtube, of cameleons changing its colors due some objects they touch? I saw one, that a chameleon turns pink when it touchs a pink glasses lens? Sorry, but that’s BS! They absolutely do change colors to match their backgrounds, or environment. While it may be true that their moods may have something to do with their color changes in some other aspects, it doesn’t mean that they don’t change for other reasons. My Jackson can blend-in perfectly with a military style camouflage when when sitting on my uniform.